This summer the centre of Prague has a new place to relax and unwind. In SOUNA(south of Národní Trřída) where there is almost no greenery the garden v Jirchářích is a welcome new comer. This small garden which backs the Slovak Evangelical church (Evangelical Church of the Augsburg Confession in the Czech Republic ) in a street of the same name is accessed right opposite Velryba and is open throughout the day. Being behind a church , one might guess that it was originally a cemetery which was put out of use 1784 by the hygiene edicts of Josef II who forbade burials within the city walls. The area though is first mentioned as the “garden of melons” as far back as 1318.In more recent times it belonged to the local gardeners association of Prague 1 which used it till 1989.Curiously, before WWII the church was used by a German Lutheran congregation which ceased to exist with the introduction of the Beneš decrees. The garden today is a nice piece of lawn, a few trees and a long table with chairs to sit around. There is even a sculptural water tap just in case you need to cool down. The garden is open during the day and is a calm oasis to chill out. Květa Pacovská is an icon of contemporary Czech art. Although known mainly as an illustrator of children’s book she is an artist in her own right. The municipal gallery of Prague in the Municipal library is showing her works of an artist, one if the main exhibitions this year. The exhibition’s name Květa Pacovská: Maximum Contrast sums up the truth that few know her as an abstract artist. She has never quite been able to abandon her connection to books which she uses as an alternative to a canvas. Before the internet her illustrated books had the advantage that her art reached many people who could not or would not otherwise visit a gallery. Her children’s illustrations have been widely used in books in France, Japan and Germany maybe thanks to her rather naïve way of painting for children. Till the 90’s most of her illustrations were for magazines or for stories of other authors. Her first solo books only appeared much later in life are really picture books where painting takes centre stage and the story line of words is just a supplement. The works presented are almost all abstract and bear very little resemblance to what children would recognize. Her abstract, sparse and often vibrant compositions make a bold display. She has stayed true to her generation of artists who sought to deconstruct rather than construct the world on canvas. During a talk she gave in January she presented a paper book from the 80’s as an art object, by carefully and systematically tearing out bits of paper from each page she was able to achieve changeable patterns which in themselves work as works of abstract art. In a curious way she has been able to cross the line between literature and art. I was myself surprised to discover her as an artist and even more surprised to at how good she is at it. Jiřík has finally made it to the Rudolfinum. He has come of age as a man and an artist. Last week I got an invitation for the opening of Jiří Černický / Divoký sny.As I have written before, the Rudolfinum which has become the pinnacle of artistic acknowledgement within the relatively small local artistic community. Having known Jirka for over 20 years I was quite curious to what he has now evolved into. 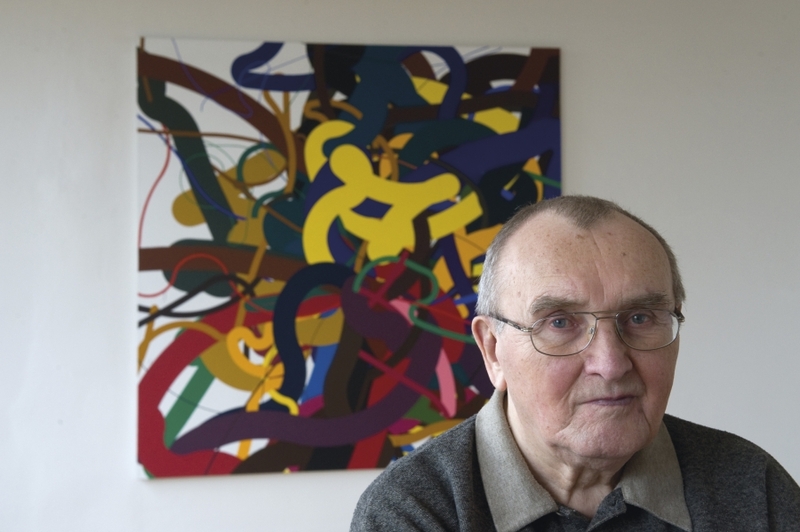 His artistic path started under communism when he enrolled to become teach Czech and art teacher which at the time also took him to study in the Soviet Union for a short while. He later dropped out and was eventually accepted to the Academy of Fine Arts in Prague. It was there that he met his wife artist Míša who has been his long suffering supporter ever since. As is often the case though he has mellowed with age and maybe even with his children. Travel has always played an important part in his of his work which was evident in numerous pieces is his biggest show to date. One of his most audacious adventures was to hitchhike from Europe to Ethiopia and back through parts of West Africa and the Sahara home. In the very early 90’s when most Czechs still mourned restricted access to Croatia due to the civil war and thought that shopping in Polish border towns was the way to go Jiří really was an explorer or unchartered lands. Politics, dissent and anti-globalism of course have been mainstay of his louvre; he is of course a self-respecting contemporary artist. Conceptualism has been a guiding force. This time George has morphed into the philosopher inventor, a sage of the world around us. While bringing up environmentalism or overpopulation in an engaging way he also make the viewer think of things we come across every day. The exhibition is very humorous with stuffed wolves and spinning halo Madonnas and acrylic walls which comes to show that the artist has matured with a tad of fun.He has come to conform to our notion of ageing rebel. I got to Letná Park every so often and although it is not always to drink beer I generally have a good time. 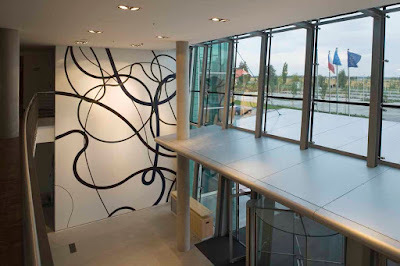 It was only now that I noticed the work of one of my favourite Czech artists on display there. Standing on the stairs of the Agricultural museum I spotted a trio of columns with a vivid black and white geometric pattern. They are in fact ventilation chimneys for the Letná tunnel right underneath. Erected in the 1969 they are one of Zdeněk Sýkora’s public works making use of architecture. This work by Zdeněk Sýkora would be much easier to see if it was not obscured by the hideous carpark in front of it. The chimneys, covered in black and white tiles are the culmination of a decade when he focused on geometric patterns. His first structural images appeared in 1960 and were further perfected in 1964 with the use of computers following a set grid. The use of computers made him an innovator in what we today know as digital graphic design. A similar mosaic from the period can also be seen in Jindřišská Street which is now part of a cafe. This smaller mosaic though is much more expressive. The mosaic in Jindřišská was originally part of the arcade. By 1970 the sharp edges were gone and were instead replaced organic line to which appear in his work for the next 40 years until his death. Sýkora made a number of works for public spaces some of which have unfortunately been lost. 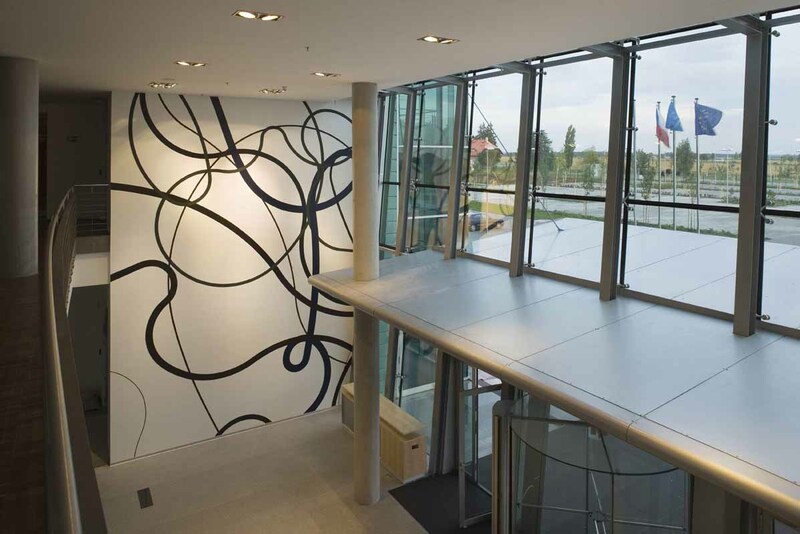 His last public architectural installation was at the in the entrance of the Air Navigation Services building near Prague in 2005.By that time though he had moved on to his “lines” which were seemingly free flowing curves on a white background. This was an interesting evolution of an artist who had spent the 40’s painting in the cubist and surrealist styles only to turn to rather traditional looking landscapes in the 50’s.His works from the 60’s onwards are in international collections and fetch some of highest sums for Czech art. Apart from Sýkora’s ventilation chimneys the park and its surroundings have a fair of modernist or contemporary architecture. The most notable being the Brussels 58 Expo Pavilion which gave its name to Czechoslovak mid-century modern. There is also the brightly clad maternity school right by the park and the buildings of the National Technical museum and the national Agricultural museum or the rather drab Ministry of the Interior. It is a pity that the communist habit of putting large scale works of art in every public space has been done away with. Not all of it was great but when I saw the new subway stations I thought that at least a bit of aesthetic care could have been taken. These chimney stacks will always serve the tunnels technical needs as well as please passers-by.